Something good always begins with this!! Last night I used four big tablespoons of Bacon Grease, A pan full of sliced mushrooms, about 8 chicken tenders, Mrs Dash for seasoning, topped it all with shredded Cheddar Colbyjack cheese. Baked at 350 for 30 minutes. Yummm !!! Ingredients 4 boneless, skinless chicken breasts 2 eggs, beaten 1 cup crushed Ritz crackers or similar butter crackers 1/2 cup butter, cut into pieces 1/2 teaspoon garlic salt pepper to taste Directions Preheat oven to 375° F. Lightly spray a 9×13 baking dish with non-stick cooking spray. Place crushed crackers in a medium size shallow bowl, add garlic salt and pepper – mix. Place eggs (beaten) in another separate medium size shallow bowl. Dip one chicken breast at a time in the eggs coating well, then dredge in the cracker crumbs, coating well on all sides. Place chicken breasts side-by-side in baking dish. *Top chicken evenly with pieces of butter. Bake on middle rack of oven for 40 to 45 minutes or until chicken is ready and internal temperature has reached a safe minimum 165 degree F internal temperature. Serve with your favorite veggies, rice, potatoes, salad and more. Enjoy! TIP *The recipe calls for placing the butter around the chicken, but I opted to place the butter on top of the chicken – it turned out wonderful! Add your favorite poultry seasonings for extra flavor (garlic/onion powder and more). Ingredients 2 teaspoons sea salt 2 pounds baby yukon gold potatoes 5 sprigs fresh thyme 1 head garlic, peeled 1 whole chicken, about 5 to 6 pounds 1/2 teaspoon dried rosemary 1/2 teaspoon onion powder 1 teaspoon paprika 1 teaspoon dried thyme 1 cup baby carrots, sliced lengthwise Instructions In a small bowl, stir together the salt, thyme, paprika, onion powder, and rosemary until combined. Set aside. Empty the chicken cavity (typically, there's a neck, heart, and liver) and trim any excess skin. Wash the chicken under cold, running water. Pat dry. On a sheet pan or large cutting board, sprinkle the spice mix on the chicken and use clean hands to spread and coat the entire chicken with the spices. Fill the chicken cavity with half of the garlic cloves from the head of garlic and the fresh thyme. With the breast side up, tuck the wings under. Add the potatoes to the slow cooker in one layer. Add the carrots, filling in the spaces between the potatoes. Add the remaining garlic cloves. Place the prepared chicken over the potatoes, breast side up, and cook on low for 8 to 9 hours, until a meat thermometer inserted into the thickest part of the breast registers 165°F. Transfer the chicken to a an oven-safe rack set over a sheet pan and remove the garlic and thyme sprigs from the cavity and place back in the slow cooker. Place chicken under the broiler until the skin is crisped and slightly darkened. Watch carefully because it will darken quickly! Pour any collected juices in the pan back into the slow cooker. Serve chicken with the cooked potatoes and carrots. Use the accumulated juices as a light sauce for the chicken and vegetables. INGREDIENTS Rub: ¼ cup olive oil 4 cloves garlic, minced 2 tablespoons brown sugar 2 tablespoons dried Italian seasoning 1 orange, juiced 1 tablespoon orange zest 1 teaspoon cumin 1 teaspoon paprika 1 teaspoon Kosher salt ½ teaspoon black pepper (or fresh cracked black pepper) ¼ teaspoon red pepper flakes (add more or less to taste) Chicken: 8 pieces of chicken (combination of leg, breast, and/or drumsticks), with skin 1 lime, quartered 1 orange, sliced 1 onion, cut into 8 sections 2-3 bay leaves PREPARATION Preheat oven to 400°F. Grease a 9 x 13-inch baking dish with butter and set aside. Whisk together all of the rub ingredients (olive oil, garlic, brown sugar, Italian seasoning, orange juice and zest, cumin, paprika, red pepper flakes, and salt and pepper) until fully incorporated. Use orange slices to line bottom of baking dish. Pat chicken pieces with a paper towel to remove any excess moisture. Generously apply rub to chicken. Place chicken pieces on top of orange slices and pour any extra rub mixture over top of chicken. Place lime and onion sections in between pieces of chicken, add bay leaves. Bake uncovered for 1 hour or until chicken juices run clear. 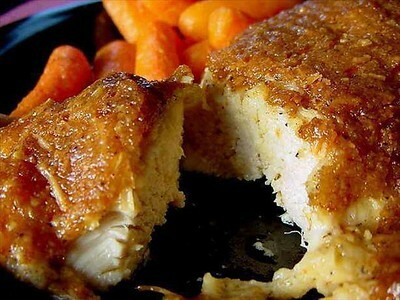 Ingredients 4-6 boneless, skinless chicken breasts 2/3 cup chicken broth 1 (4.4 oz.) package spreadable herb cheese (we use Boursin) 1 shallot, minced 1 large clove garlic, minced 1/2 lemon, zested and juiced 2 tablespoons extra-virgin olive oil, divided 1 tablespoon all-purpose flour 1 teaspoon dried basil 1 teaspoon dried oregano 1 teaspoon dried tarragon kosher salt and freshly ground pepper, to taste Directions: Brush chicken breasts with 1 tablespoon olive oil and season generously with salt and pepper. 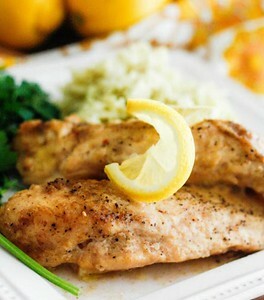 Heat a large pan or skillet over medium-high heat and cook chicken breasts until opaque and no longer pink. Transfer to a plate and set aside. To the same skillet, heat remaining olive oil and sauté shallot and garlic, with basil, oregano and tarragon, for 1-2 minutes, or until fragrant. Stir in herb cheese, broth, lemon juice and zest, and whisk together until smooth, then sprinkle in flour and whisk until incorporated. Cook for 5-10 minutes, or until sauce has thickened. Return chicken to skillet and cook for another 2-3 minutes, or until warmed through. Garnish with fresh herbs and serve hot! 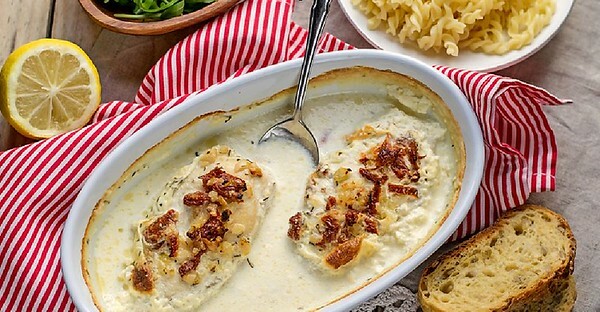 INGREDIENTS 6 boneless, skinless chicken breasts 1 tablespoon olive oil 3 cloves garlic, roasted and minced 1/4 cup sun-dried tomatoes, drained and chopped 1 cup heavy cream 1 cup chicken broth 2 tablespoons flour 1/4 cup white wine or water 1/4 cup fresh basil, chopped 3/4 cup parmesan cheese, grated Salt and pepper, to taste PREPARATION Preheat oven to 350º F. Heat olive oil in medium skillet over low heat. Place chicken breasts in oil and brown lightly on both sides, about 6 minutes total. Transfer chicken to baking dish. Keep medium skillet over low heat, and add chicken broth and heavy cream to pan drippings. Whisk together until sauce reaches a boil. 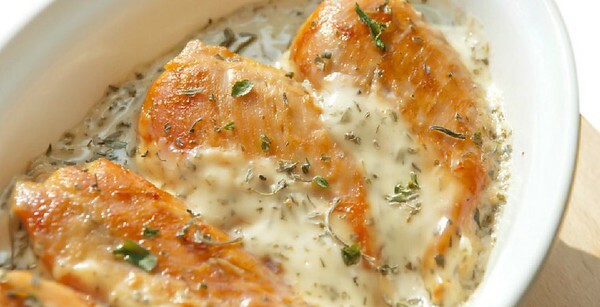 Pour sauce over chicken breasts and bake for 20 minutes. 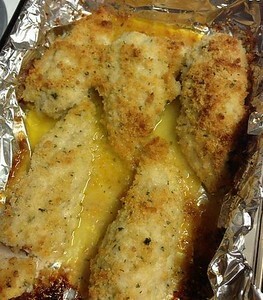 Remove chicken breasts from baking dish. Strain sauce, then pour it back into medium skillet. Bring sauce to a boil and gradually stir in flour until thickened. Add water or white wine and continue cooking for 1 minute. Remove sauce from heat. Stir in parmesan cheese, and add salt and pepper to taste. 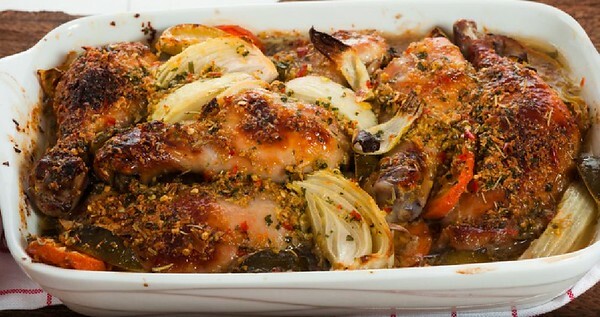 Return chicken and sauce to baking dish. Top chicken pieces with sun-dried tomatoes and roasted garlic. Return to oven and bake for 10 minutes. Garnish with chopped basil before serving. 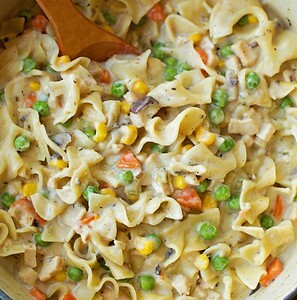 Ingredients: 2 tbsp vegtable oil 2 lbs boneless skinless chicken breast (diced) 1 carrot (sliced) 1 onion (diced) 3 cloves garlic (minced) 5 tbsp butter 6 tbsp flour 6 cups chicken broth 1/2 cup heavy cream 1/2 tsp thyme 2 bay leaves 1 1/2 cups frozen peas (thawed) Brown chicken in oil, remove and hold. Saute onion and carrot until tender. Add garlic and saute lightly. Add butter and flour and stir to cook flour. Add cream and chicken broth. Add bay leaves, peas, and thyme. Cover and simmer 15 minutes Dumplings: 2 cups self rising flour pepper to taste 1 1/3 cups heavy cream Mix and make into walnut sized balls and drop into boiling broth mixture. Sprinkle with 4 Tblsp frech parsley (chopped) Cover and simmer another 15 minutes. Ingredients 2 boneless chicken breast 8 oz. 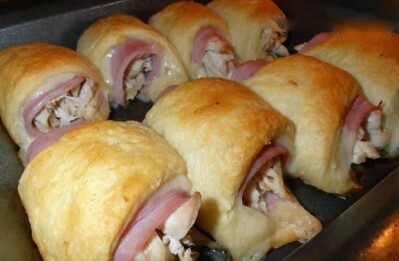 crescent roll dough 8 slices swiss cheese 8 slices cooked ham How to make it Boil the chicken breast until they are cooked through. Allow them to cool and then shred the meat. Unroll each triangle of crescent dough. Tear the cheese to fit the triangle and place on top of the dough. Place a piece of the ham on the top (larger) portion of the dough (I cut my ham in half to double it up in the roll). On top of the ham add some of the shredded chicken and then gently roll it up. Place each one on a baking sheet that his been lightly sprayed with cooking spray. Bake then in a 350 degree oven for 20-25 minutes, until the top is nice and golden. 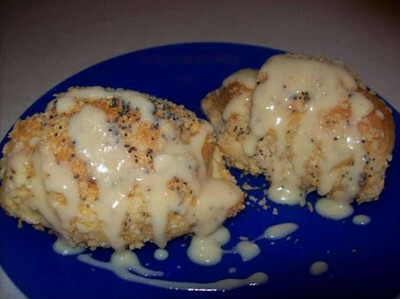 Ingredients: 4 boneless, skinless chicken breats 1 packet ranch dressing mix ¾ Cups Panko bread crumbs ¾ Cups Parmesan cheese ½ Cups Melted smart balance spread Or your choice of butter product 1 Greased baking dish( or 2) 2 medium bowls Instructions: Supplies. In a medium bowl, mix ranch packet, bread crumbs & Parmesan cheese. Set aside. Boneless, skinless chicken breasts. Preheat oven to 350. Clean & rinse chicken. Cut each piece in half, the long way. Use a paper towel to pat chicken dry. Melt smart balance spread (or butter) in medium microwave bowl. Dip each piece of chicken into melted butter. Cover both sides. Then press each side of the chicken into the breading mix. Place in greased baking pan. Do this for each piece. I lined my baking dish with foil, which I sprayed with Pam to keep the chicken from sticking. 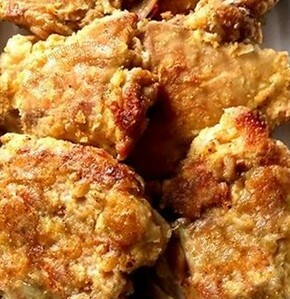 INGREDIENTS •	2 pounds skinless boneless chicken thighs, cut into 2-inch chunks •	Salt and pepper •	2 tablespoons olive oil •	1 large onion, diced (about 1 1/2 cups) •	1 large sprig thyme, plus 1 teaspoon freshly chopped leaves •	1 bay leaf •	1 cup white wine •	2 cups basmati rice, soaked for 20 minutes, rinsed and drained •	8 ounces king trumpet mushrooms, or a mixture of mushrooms, sliced 1/4-inch thick •	4 cups hot chicken broth •	3 tablespoons unsalted butter •	1 cup frozen peas, cooked for 2 minutes in salted water (optional) •	2 small garlic cloves, smashed to a paste with a little salt •	3 tablespoons roughly chopped parsley PREPARATION 1. Put chicken pieces on a baking sheet and season generously with salt and pepper. Set aside. Heat oven to 350 degrees. 2. Pour olive oil into a 4-quart enamelware Dutch oven or similar heavy pot and set over medium-high heat. Add onions and cook, stirring, until nicely browned, 8 to 10 minutes, then season with salt. Add chicken, thyme sprig and bay leaf, and continue to cook, stirring, for 2 minutes more. 3. Add wine and simmer briskly until reduced by half, about 5 minutes. 4. Add rice and a large handful of mushrooms and stir to combine. (Reserve most of the mushrooms for garnish.) Add broth and bring to a simmer. Check broth for seasoning and adjust. 5. Cover pot and cook for 10 minutes over medium heat. Transfer pot to oven and bake for 20 minutes. Finally, remove from oven and let rest for 10 minutes off heat. 6. While rice is baking, sauté remaining mushrooms: Melt butter in a large skillet over high heat. Add mushrooms, season with salt and pepper and cook, rapidly stirring, until they have softened and browned, 5 to 7 minutes. Add peas, if using, and heat through. Turn off heat, then add reserved chopped thyme, the garlic and the parsley. Toss to coat well. 7. 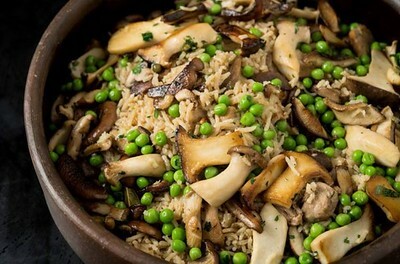 Fluff rice, then top with sautéed mushrooms and serve. 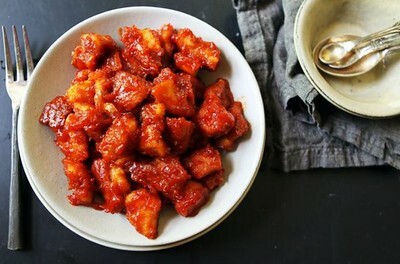 INGREDIENTS 3/4 cup low-sodium soy sauce 1/2 cup water 1/4 cup brown sugar 1/2 teaspoon ground ginger 1/2 teaspoon minced garlic 2 Tablespoons cornstarch + 2 Tablespoons water 2 small boneless skinless chicken breasts 1 (12 oz.) bag stir-fry vegetables (Can be found in the produce section) 3 cups cooked brown or white rice INSTRUCTIONS Preheat oven to 350° F. Spray a 9×13-inch baking pan with non-stick spray. 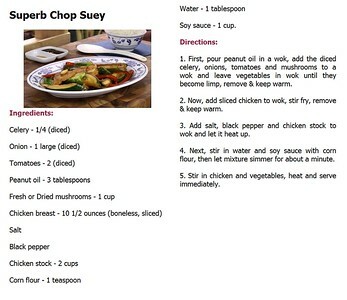 Combine soy sauce, ½ cup water, brown sugar, ginger and garlic in a small saucepan and cover. Bring to a boil over medium heat. Remove lid and cook for one minute once boiling. Meanwhile, stir together the corn starch and 2 tablespoons of water in a separate dish until smooth. Once sauce is boiling, add mixture to the saucepan and stir to combine. Cook until the sauce starts to thicken then remove from heat. Place the chicken breasts in the prepared pan. 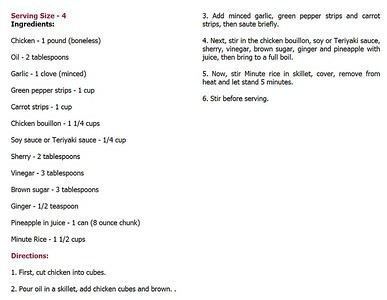 Pour one cup of the sauce over top of chicken. 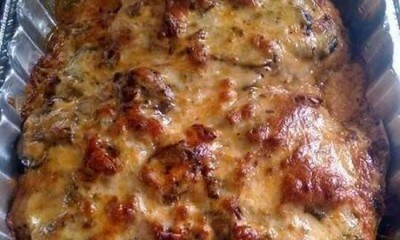 Place chicken in oven and bake 35 minutes or until cooked through. Remove from oven and shred chicken in the dish using two forks. *Meanwhile, steam or cook the vegetables according to package directions. 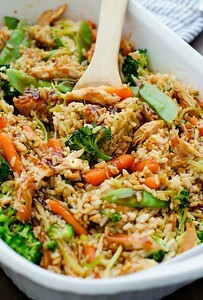 Add the cooked vegetables and rice to the casserole dish with the chicken. Add most of the remaining sauce, reserving a bit to drizzle over the top when serving. 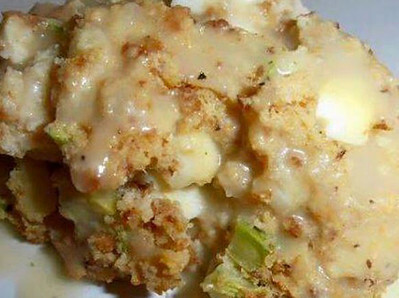 Gently toss everything together in the casserole dish until combined. Return to oven and cook 15 minutes. Remove from oven and let stand 5 minutes before serving. Drizzle each serving with remaining sauce. Ingredients 1 pound cooked pasta 2 garlic cloves, chopped 2 tablespoons extra virgin olive oil 3 tablespoons vegetable oil 1 bell pepper, chopped 1 small onion, chopped 1 celery stick, chopped 2 tablespoons all-purpose flour 1 1/2 cup vegetable stock 2 teaspoons Hungarian paprika 1 pinch cayenne pepper salt and pepper to taste 2 chicken breasts, cubed 1/2 cup gorgonzola cheese 2 cups Havarti cheese Instructions Cook pasta until it reaches al dente stage, drain it and mix with olive oil and garlic. Let it cool. On medium high heat soften bell pepper, onion and celery in vegetable oil for 2-4 minutes or until translucent. Add paprika, cayenne pepper, salt and pepper and mix with vegetables. Add chicken and let it get color on one side; it will take couple of minutes. Flip chicken to the other side and let it cook for another minute or so. Add flour and mix it in with oil. Cook it for minute or so. Add vegetable stock, mix it in and add Gorgonzola. Mix Gorgonzola in and let it melt. Remove from the heat and mix with pasta. Transfer the pasta with sauce to 9″ by 13″ oven safe dish slightly oiled. Sprinkle Havarti on top and bake for 30 minutes or until the cheese is melted. You’ll Need: 4 boneless chicken breast halves. 1 cup of mayonnaise. ½ cup of freshly grated parmesan cheese. 1 ½ tsps of seasoning salt. ½ tsp of ground black pepper. 1 tsp of garlic powder. How to: In a bowl, mix together the mayonnaise, cheese and seasonings and spread it over the chicken breast. Place the coated chicken in the baking dish and bake for 45° in a preheated oven to 375°. You’ll Need: 12 oz of green beans. 5 chicken breast cut into cubes. 2 lbs of cubed red potatoes. 1 packet of zesty Italian dressing mix. Salt and pepper. 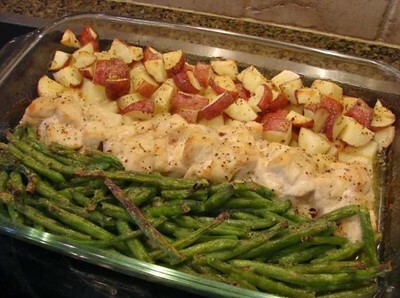 How to: In a 9×13 baking dish or a larger one, layer the green beans, chicken and potatoes side ways. Pour the melted butter all over it and drizzle the italian dressing mix over the top. In a preheated oven to 350° bake for 1 hour. Roasting with Convection: In Convection the heated air in the oven is continuously circulated penetrating the food from the outside to the center. •	Meats should be cooked on a rack in a shallow pan for maximum exposure and to prevent juices from being leeched out by the heat of the pan. •	Pan juices will be minimal, however the juices can be easily captured prior to carving and yield up to 4 cups for gravy. •	Turning and basting are not required when roasting in Convection. •	Higher temperatures than standard recipe temperatures are used when roasting turkey in Convection and cooking times are much shorter. •	Once the turkey is resting multiple side dishes can be cooked in the oven at one time ensuring that all the dishes are hot and ready at the same time. In short using Convection makes the cooking easy, the timing is perfect and the results are fabulous. Timing Guide for Convection Roasting The timing we have established for roasting turkeys in Convection is based on the following criteria: 1. Letting the turkey sit outside of the refrigerator for a minimum of 2 hours. 2. Cooking the turkey without stuffing. 3. Roasting the turkey on a rack in a shallow pan with the legs swinging free. 4. Cooking the turkey in the Convection Roast mode at 400 degrees for 20 minutes then reducing the temperature to 350 degrees/375 for large capacity ovens, for the remainder of the cooking time. 5. Cook the turkey to an internal temperature of 160-170 degrees in the thickest part of the thigh and allow it to rest for 20 minutes prior to carving, in this time the internal temperature rises to 180 degrees. 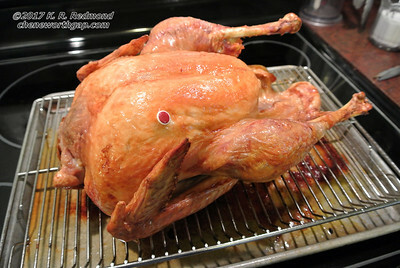 Turkey weight**********Cooking time*********Resting time 10-12 lb. turkey******1 ½ hours******20 minutes 12-15 lb. turkey******1 ¾ hours******20 minutes 15-20 lb. turkey******2 hours******20 minutes 20-25 lb. turkey******2 ½ hours******20 minutes Making the Gravy When roasting in Convection you will be wondering where all the juice is, but after the 20-minute resting period pick up the turkey with two kitchen towels and drain the juices into a bowl, you will be amazed at how much comes pouring out. The next step will be to skim off the fatty liquid that rises to the top of the bowl and discard it then add the liquid gravy. Be sure to use a rimmed carving board because even more juices will start to flow as you carve the bird. Whichever method you choose for making the gravy, it’s good to start with a giblet stock for added flavor and extra liquid. The giblet stock can be made the day before when you wash and season the turkey. Method 1-Make a roux and add the giblet stock and cooking juices from the turkey. Method 2-Make a giblet stock, deglaze the roasting pan, make a roux in the pan and add the giblet stock and cooking juices, this method gives you the advantage of also scraping up all the luscious caramelized bits on the bottom of the pan. 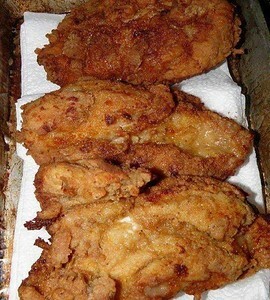 INGREDIENTS 1 ½ pounds boneless chicken, preferably dark meat, in 1/2- to 1-inch chunks ½ cup flour, more as needed 4 tablespoons neutral oil, like corn or canola Salt and pepper 2 tablespoons slivered garlic ¼ teaspoon cayenne pepper, or to taste 1 cup ketchup PREPARATION Toss chicken with flour so that it is lightly dusted. Put 2 tablespoons oil in a large skillet, preferably nonstick, and turn heat to high. When oil smokes, add chicken in one layer. Sprinkle with salt and pepper. When chicken browns on one side, toss it and cook until just about done: smaller pieces will take 5 minutes total, larger pieces about 10. Remove to a plate. Turn off heat and let pan cool for a moment. Add remaining oil to pan and turn heat to medium high. Add garlic and cayenne pepper and cook, stirring, about 2 minutes. Add ketchup and stir; cook until ketchup bubbles, then darkens slightly. Return chicken to pan and stir to coat with sauce. Taste and adjust seasoning, then serve. INGREDIENTS 1 whole chicken, 3 to 4 pounds, trimmed of excess fat 3 tablespoons extra-virgin olive oil Salt and freshly ground black pepper PREPARATION Put a cast-iron skillet on a low rack in the oven and heat the oven to 500 degrees. Rub the chicken all over with the oil and sprinkle it generously with salt and pepper. When the oven and skillet are hot, carefully put the chicken in the skillet, breast side up. Roast for 15 minutes, then turn the oven temperature down to 350 degrees. Continue to roast until the bird is golden brown and an instant-read thermometer inserted into the meaty part of the thigh reads 155 to 165 degrees. Tip the pan to let the juices flow from the chicken’s cavity into the pan. Transfer the chicken to a platter and let it rest for at least 5 minutes. Carve and serve. 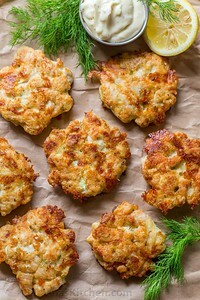 Cheesy Chicken Fritters Ingredients Ingredients for Chicken Fritters: 3 large (or 1½ lbs) chicken breasts 2 large eggs ⅓ cup mayonnaise ⅓ cup all-purpose flour (or cornstarch or potato starch for gluten free) 4 oz (or 1⅓ cups shredded) mozzarella cheese 1½ Tbsp chopped fresh dill ½ tsp salt and ⅛ tsp black pepper, or to taste Extra light olive oil, or any high heat cooking oil Ingredients for Garlic Aioli Dip (Optional) ⅓ cup mayonnaise 1 garlic clove, pressed ½ Tbsp lemon juice ¼ tsp salt ⅛ tsp black pepper Instructions Using a sharp knife, dice chicken into ⅓" thick pieces and place them in a large mixing bowl. Tip: If chicken breast is partially frozen, it will be a little bit easier to slice. Into the mixing bowl, add remaining batter ingredients: 2 eggs, ⅓ cup mayonnaise, ⅓ cup flour, 1⅓ cups shredded mozzarella, 1½ Tbsp dill, ½ tsp salt and ⅛ tsp black pepper, or season to taste. Stir the mixture until well combined, cover with plastic wrap and refrigerate 2 hours or overnight. Heat a large non-stick pan over medium heat and add 2 Tbsp oil. When oil is hot, add the chicken mixture a heaping Tablespoon at a time. I used a trigger release ice cream scoop for even portioning). Slightly flatten out the tops with the back of your spoon and sauté uncovered 3-4 minutes on the first side, then flip and saute 3 minutes on the second side or until outsides are golden brown and chicken is fully cooked through* To make the aioli (if using), combine all ingredients in a small bowl or measuring cup and stir together until smooth. Notes *To test for doneness, cut a fritter in half and the chicken should be completely white inside. If your chicken is browning too fast, adjust your heat down. The Coating This is where the Colonel's Secret Recipe comes into play. The seasoning is as follows: 2/3 tablespoon salt 1/2 tablespoon thyme 1/2 tablespoon basil 1/3 tablespoon oregano 1 tablespoon celery salt 1 tablespoon black pepper 1 tablespoon dried mustard 4 tablespoons paprika 2 tablespoons garlic salt 1 tablespoon ground ginger 3 tablespoons white pepper I mixed the above seasoning with two cups of flour. While I am a large fan of the paper bag method for fried chicken, I don't see every KFC on the planet shaking chicken in a bag before frying, I skipped it this round and went with the more traditional flour-egg-flour dredge in shallow pans. Frying Method I, like most people I imagine, don't own a pressure fryer. These things are a few hundred dollars and aren't exactly a go-to small appliance for most homes. I do own a pressure cooker, but adding hot oil to a pressure cooker can create all sorts of havoc. So I fried the chicken in my tabletop fryer (360°F until internal chicken temperature reaches 165°F — roughly eight minutes), as I am a fan of the lid which regulates temperature and lack of splatters. The Results You know how you try "the ultimate" whatever recipe that surfaces online and, although it tastes good, it never really lives up to the brand name of the real thing? 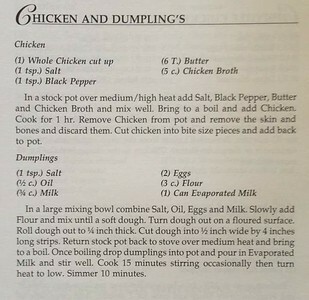 This recipe ... this isn't that. You guys. Seriously. I can't. The taste of its crispy skin is a dead ringer for its commercial counterpart. KFC might deny that the spice mixture given to the Chicago Tribune is incorrect, but it sure tastes like the real thing. The taste of its crispy skin is a dead ringer for its commercial counterpart. The texture, on the other hand, was not an identical match to KFC. Although I greatly enjoyed the extra-crunchy, thick skin of the chicken, it didn't foster the same memories of the soft yet textured skin that come spilling out of the traditional red-and-white bucket. If I wanted to make this recipe as KFC as possible, I think my beloved paper bag method for flouring would have been more thin and even. Ingredients 1 small onion 1 1/2 teaspoons butter 2 lbs chopped cooked chicken breasts or 2 lbs boneless skinless chicken thighs 1 (10 3/4 ounce) can cream of chicken soup 1/2 cup mayonnaise 1 cup milk 1/2 cup chopped pimiento or 1/2 cup sauteed red bell peppers or 1/2 cup jarred roasted red pepper 1 1/2 cups shredded mild cheddar cheese refrigerated biscuit Directions 1 Preheat oven to 350. 2 Grease the bottom and sides of an 11×7 inch baking dish or 10 inch quiche dish. 3 Chop the onion. 4 Heat butter in a small nonstick skillet and saute until tender. 5 Combine cooked onion, soup, chicken, milk, pimiento, and mayo in a bowl and then turn into the prepared baking dish. 6 Bake for 15 minutes and remove from oven. 7 Sprinkle 1 cup of the cheese over the baked mixture. 8 Arrange biscuits decoratively in a single layer and sprinkle remaining 1/2 cup cheese over them. 9 Return casserole to oven and bake until biscuits are golden brown and sauce is bubbly, usually about 20 minutes longer. 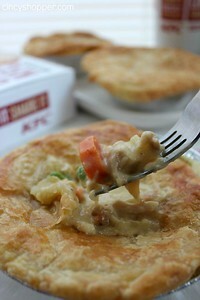 INGREDIENTS 8 Chicken Thighs, boneless and skinless, organic 3 cups Flour, all-purpose, organic 4 tbsp. Sunflower Oil 1/2 tsp. Sea Salt 1/2 tsp. Black Pepper 1/2 tsp. Onion Powder 1/2 tsp. Garlic Powder 1/4 tsp. Crushed Red Pepper 1/4 tsp. Oregano 1/2 tsp. Paprika 1/4 tsp. Chili Powder DIRECTIONS 1. Preheat oven to 300 F. 2. Rinse the chicken thoroughly. 3. Mix all spices together. 4. In a separate bowl add half of the seasoning mix to the Sunflower oil. 5. Add another half of the seasoning mix to the separate bowl with a flour. 6. Brush each chicken thigh thoroughly with the oil and spice mixture and rub well with the flour mix. 7. 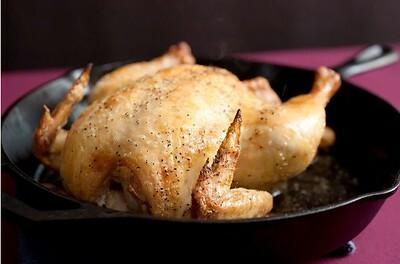 Place chicken on a non-stick baking tray. 8. Bake chicken for 30 to 35 minutes at 300 F. Then turn oven to 475 F and bake for 15 minutes (flip chicken during the middle of the cooking process) until golden and crispy and a minimum internal temperature of 165 F or greater as measured by a meat thermometer. 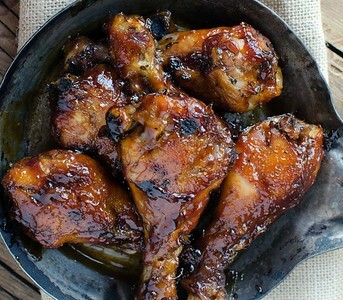 Ingredients 6 large Chicken legs, bone in, skin on (can be removed if you wish) 1/2 C Ginger honey (can substitute regular honey) 1/8 C Molasses 1/8 C Sugar (can substitute brown sugar) 1/2 C Soy Sauce (low sodium can be substituted) 1 tsp Siracha (can add more if you wish) 1 tsp Grated Ginger 1 TBSP.Cornstarch 1 TBSP. Water Seasonings: Seasoned Salt, pepper and garlic powder – sprinkling as desired For the glaze: 6 slices bacon, chopped 1/4 cup Honey 3 tablespoons Worcestershire sauce Instructions Combine cornstarch and water in a small bowl. Set aside. Then, in a pot, combine ginger honey, molasses, sugar, soy sauce, ginger, and siracha. Bring to a boil. Add the cornstarch and water slurry, – the sauce will thicken, then remove off the heat. Line the slow cooker with parchment paper for easy cleanup and to avoid sticking In a bowl, season the chicken legs with salt, pepper and garlic Add the legs to the slow cooker bowl along with the glaze you just made, add 1/2 C of water and cook on high for 3 hours. Glaze In a pan, cook the bacon until it is crisp, then remove to a paper-towel-lined plate and let cool. If you didn’t chop it, crumble it now. Set aside. 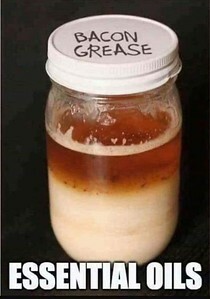 Drain the grease,. Add the honey & Worcestershire sauce Let bubble over medium heat. Once it is bubbly, add in the chopped bacon. Stir and cook for 1-2 minutes until it has thickened lightly, then remove from heat.set aside When 3 hours is up, add this sauce to your chicken in the Crockpot, Cook for an additional hour. After cook time is complete, remove the legs and place them on a baking sheet Take the sauce from the crock pot bowl and put into a smaller container. Using this sauce, baste the legs liberally all over. Broil the legs in the oven until they begin to caramelize Bring the sheet out and turn the legs over, then liberally brush the legs again with the sauce. Broil again for a few minutes or until the legs begin to caramelize. If there is remaining sauce left, feel free to use as a dipping sauce. INGREDIENTS 8 Chicken Thighs, boneless and skinless 3 cups Flour, all-purpose 4 tbsp. Sunflower Oil 1/2 tsp. Sea Salt 1/2 tsp. Black Pepper 1/2 tsp. Onion Powder 1/2 tsp. Garlic Powder 1/4 tsp. Crushed Red Pepper 1/4 tsp. Oregano 1/2 tsp. Paprika 1/4 tsp. Chili Powder DIRECTIONS 1. Preheat oven to 300° F. 2. Rinse the chicken thoroughly. 3. Mix all spices together. 4. In a separate bowl add half of the seasoning mix to the Sunflower oil. 5. Add another half of the seasoning mix to the separate bowl with a flour. 6. 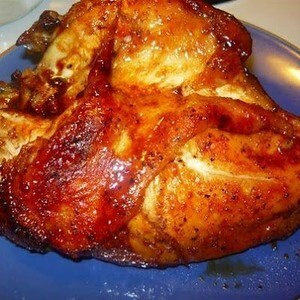 Brush each chicken thigh thoroughly with the oil and spice mixture and rub well with the flour mix. 7. Place chicken on a non-stick baking tray. 8. 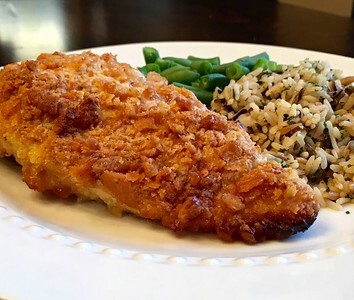 Bake chicken for 30 to 35 minutes at 300° F. Then turn oven to 475° F and bake for 15 minutes (flip chicken during the middle of the cooking process) until golden and crispy and a minimum internal temperature of 165 F or greater as measured by a meat thermometer. 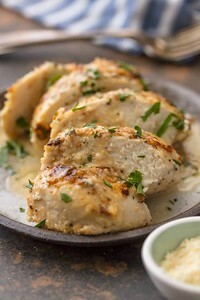 Ingredients 4 skinless, boneless chicken breasts 1 cup creamy Caesar salad dressing (definitely grab a creamy Caesar versus a thinner version) 1-1½ cup grated Parmesan cheese ***OPTIONAL: 1/2 cup sour cream or mayonnaise. 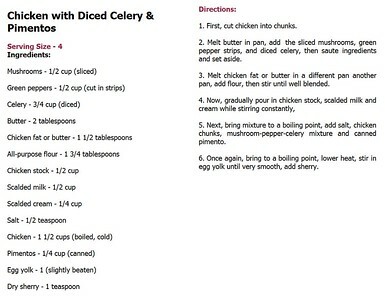 See note below Instructions * Note: Do NOT salt the chicken. Heat oven to 375° F and spray the inside of an 8x11 baking dish with cooking spray. If the breasts are uneven thickness, pound them (placed in a Ziploc bag and on a flat surface) to an even ¾”-1” thickness using a meat pounder. Sprinkle the breasts (both sides) with grated Parmesan cheese & freshly ground black pepper, and place them in the prepared baking dish. Pour ¼ cup Caesar salad dressing over each breasts then sprinkle grated Parmesan cheese on top. Place the prepared chicken in the oven and bake at 375F for 30 minutes or until a meat thermometer inserted in the middle of one of the middle breasts reads 155° F. Turn the oven to broil and broil the breasts an additional 2-4 minutes or until the chicken turns golden. It can burn quickly, so watch it closely. When done, a meat thermometer should register 160F when stuck into the thickest part of one of the middle breasts. Remove from the oven, cover loosely with foil and allow chicken to rest 5-10 minutes before serving. Enjoy! ***OPTIONAL: If you prefer a thicker crust of sauce on top, add in either 1/2 cup sour cream or 1/2 cup mayo to the Caesar and Parmesan mixture. It is totally optional but can add a thicker layer of creaminess! The pictures above are without the extra layer..
1 lb boneless skinless chicken breasts, diced small 8 oz cream cheese, softened 1/2 cup butter, melted 2 Tbsp minced dry onion 0.7 oz packet dry Italian salad dressing mix 2 Tbsp milk 12 oz can big and buttery crescent rolls 1 Tsp garlic salt 1 tsp cracked black pepper 1 tsp seasoned salt 2 cups Panko Italian Crispy bread crumbs 1 tsp poppy seeds 1 Tbsp extra virgin olive oil 10 3/4 oz cream of chicken soup 1 cup sour cream 1 Tbsp mayo 1/4 cup milk 1 Preheat oven to 350 degrees. Heat olive oil in a skillet and add diced chicken, browning until juices run clear, about 15 minutes. Blend cream cheese and 2-3 Tablespoons melted butter until smooth. Add to the skillet of chicken. Add Italian seasoning, salt, pepper, milk and onions. Simmer 5 minutes and mix well. Unroll crescent rolls out to their triangle shape. Spoon chicken mixture onto the center of each separated dough, leaving a little room on the sides and top. Rolling from the top towards the small end and then pinching the sides together, this will turn out somewhat like a ball. In a bowl, roll crescent roll in the remaining melted butter and then in bread crumbs. In a separate bowl, place poppy seeds and roll crescent in them. Place on baking sheet and bake 20-25 minutes or until rolls are done. (slightly brown) Top with gravy. 2 To make the gravy, combine cream of chicken soup, sour cream, mayo and 1/4 cup milk. Cook over medium heat until heated through. 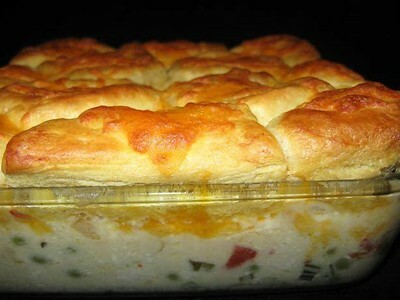 INGREDIENTS 1 lb Chicken Breast 12 oz Frozen Peas and Carrots, thawed 2 cup Frozen Diced Potatoes, thawed (like Hash Browns or Potatoes OBrien) 1 Onion diced 2 can Cream of Chicken Condensed Soup 1 cup Water 2 cans Refrigerated Crescent Rolls. 1/2 tsp Poultry Seasoning Salt and Pepper to taste. DIRECTIONS Grill chicken breasts until cooked through. Allow to cool. Grill diced onions until transparent. Set aside. Dice chicken into 1/2″ cubes. Preheat oven to 350. Grease a 11×13″ baking dish. Unroll 1 can of crescent rolls and pinch perforations to seal into a sheet. Press into bottom and up sides of prepared disk. Don’t worry if sides do not go all the way up. Bake for 20 minutes or until crust is light brown. Allow to cool. 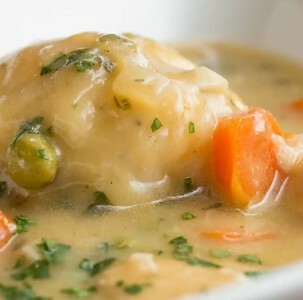 In a large skillet, combine chicken cubes, diced onion, water, potatoes and peas and carrots. Stir and cook over medium heat until ingredients are warm (5-10 minutes). Add soup and poultry seasoning and continue heating for another 5 minutes. If sauce looks too thick, slowly add a little more water until desired consistency is reached. Pour chicken mixture over baked crust and spread evenly. Unroll other can of crescent rolls and pinch perforations to seal into a sheet. Place over top of chicken mixture and press into sides of dish. Bake for 25 minutes or until top is golden brown. 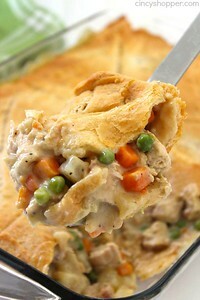 INGREDIENTS 6 5-6″ Foil Pot Pie Tins 1 Rotisserie Chicken or Fried Chicken 2 sheet Puff Pastry Dough 4-5 Potatoes 4-5 Carrots 2 cup Frozen Peas 2 can Cream of Chicken Soup 15 oz Milk 1 tsp Sugar Salt and Pepper (to taste) DIRECTIONS Pick meat from bones and cut into bite size pieces. Peel and cut potatoes into 1/2″ cubes. Peel and slice carrots into 1/4″ slices. Remove pastry from box and thaw at room temperature. Boil potatoes and carrots in water until almost tender. Drain liquid, add frozen peas and set aside. In a large pot, add soup, milk, and sugar. Mix well and simmer. Preheat oven to 400. Add chicken and vegetables to the sauce and simmer until warm, stirring frequently. Spoon mixture into each pie tin, Do not over fill. Cut pastry into 6″ circles and then roll slightly to make sure crust will overlap rim. Moisten edges of pastry and cover each tin pressing edges to the rim. Bake at 400 18 minutes. 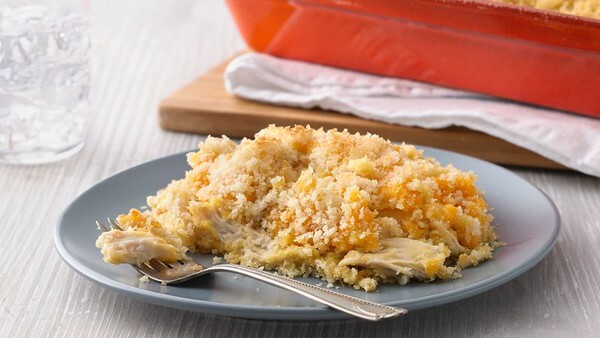 Ingredients 3 cups cooked chicken, chopped 2 cans (10.75 oz each) cream of chicken soup 2 cups shredded Cheddar cheese 3 cups panko crispy bread crumbs or any dry stuffing mix 6 tablespoons butter or margarine, melted Steps 1 Heat oven to 350°F. 2 Place chicken in bottom of ungreased 13 x 9-inch baking dish. Spoon soup evenly over chicken and top with shredded cheese. 3 In medium bowl stir together melted butter and breadcrumbs. Sprinkle over baking dish. Bake 35 to 40 minutes or until bubbly. Slowcooker INGREDIENTS: 4 boneless skinless chicken breasts 1/4 cup flour 1 tsp pepper 1/4 cup butter 1 package dry italian dressing/seasoning mix 1/2 cup fresh lemon juice 1/2 cup chicken broth salt and pepper to taste DIRECTION: 1. Prepare your chicken by rinsing it and trimming the fat. Since the chicken breasts that I buy are always huge, I cut them in half making them more like tenders. 2. In a shallow dish, combine the flour and pepper. Coat the chicken in the flour. 3. Melt the butter in a saucepan on your stovetop over medium heat. Once melted, brown each side of the chicken, but not cooking it throughout because you will be putting them in the crockpot. You just want them to have a nice golden brown breading on each side. 4. 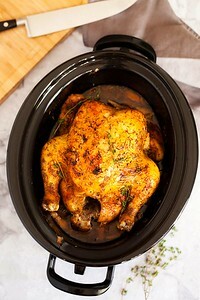 Spray crockpot with cooking spray and place the chicken into the crockpot. Sprinkle the italian seasoning package top of the chicken. 5. Mix together the lemon juice and chicken broth. Pour over the chicken and seasonings. 6. Cook on low for 3-4 hours. Enjoy! INGREDIENTS : 2 beaten eggs 1 cup milk 2 teaspoon paprika 1/2 teaspoon poultry seasoning 4 teaspoons garlic salt 2 teaspoon black pepper 2 cups all-purpose flour How to make it : Beat the egg and milk together in a bowl. Combine the flour with the garlic salt, pepper, poultry seasoning and paprika in a big plastic bag. Put the chicken in the bag, seal it and shake to coat it. Dip the flour-coated chicken in the egg mixture and again in the flour mixture. 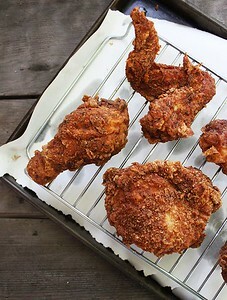 Heat the oil in a skillet to 365 degrees F. Brown the chicken on all sides in the hot oil. Turn the heat down to medium low and give the chicken another half an hour or until it is cooked through. Drain it on paper towels and serve. You’ll Need: Chicken. A packet of dry Italian seasoning mix. ½ cup of brown sugar. How to: Preheat the oven to 350° and line a pan with foil. In a bowl, mix together the Italian seasoning mix with brown sugar and coat the chicken well. 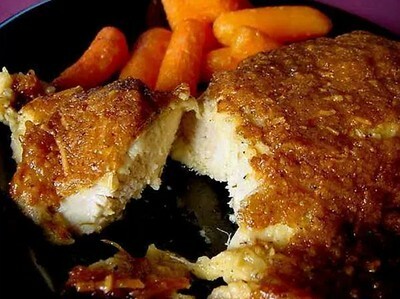 Place the coated chicken in the pan and bake for 25 minutes on each side until golden brown.